Biang Biang noodles show you the power of simplicity. With a spoonful of savory seasoned soy sauce and fresh, nutty hot sauce, the thick and meaty handmade noodles will bring you to foodgasm! Does the name of this dish sound strange enough? Biang Biang noodles is actually a simple spicy noodle dish. The noodles are freshly made and quite wide and thick. The word “biang” is an onomatopoeia – it mimics of the sound made in the process making the noodles, when the dough is pulled and slapped against the working surface. The dish is classified as cuisine of the poor, since it is so basic and cheap. Even in Beijing, where the average lunch usually costs 4 to 8 dollars, a big bowl of Biang Biang noodles only costs 2. This simple noodle dish is the signature of Shaanxi, a province not well known for its food. However, Biang Biang noodles have become quite trendy as of late. There is even a New York restaurant named after it and featuring it as the signature dish. 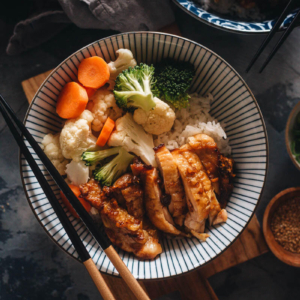 Wikipedia says that the reason it’s becoming trendy is that the name of the dish contains the most complicated Chinese character – it has 58 strokes. Insane, right? You can see how it looks in the picture to the right. But if you ever try this dish, even once, you’ll learn that its popularity is due to its simplicity and great flavor. The idea of Biang Biang noodles is really simple but there are unlimited ways to serve it. 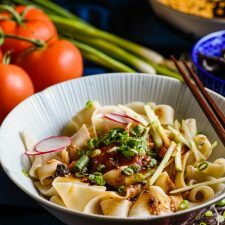 The basic version of the dish uses thick and wide hand-ripped noodles, drizzled with tons of hot chili oil, chili flakes, and soy-sauce-based seasoning. For homemade versions, people add all kinds of simple toppings, such as blanched bean sprouts and simple stir-fried or raw veggies. As for the restaurant version, fancy items like chicken, beef, and lamb are often placed on top. I had the best bowl of Biang Biang noodles when I was visiting Xi’an (the city of origin for this dish) with Thomas. It wasn’t even a famous restaurant or one one with particularly good reviews, just a random small bistro that we came across on the side of the road. 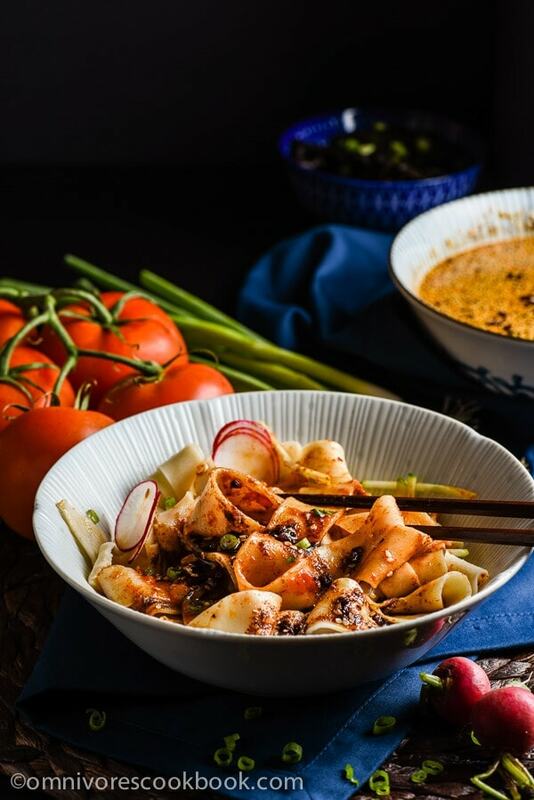 The big bowl of fat noodles was topped with tomato and egg stir fry, a rich chili sauce, and extra chili flakes. It was so simple, yet also rich and satisfying. 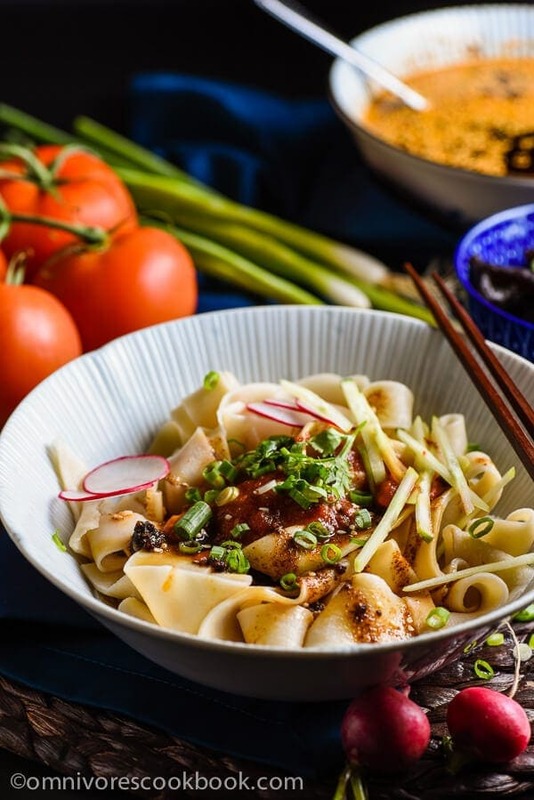 When trying to recreate the Xi’an version of these noodles at home, I tried several methods and finally found a perfect one. 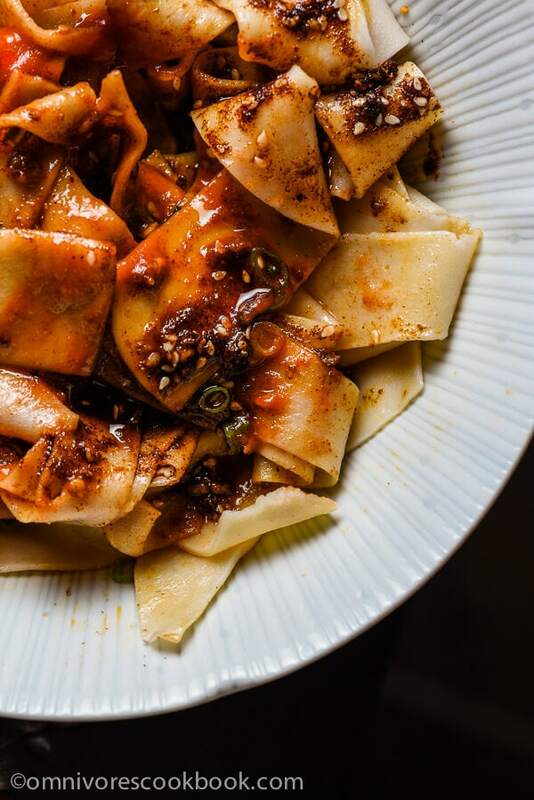 The chili oil and seasoned soy sauce in the recipe below were adapted from Xi’an Famous Hot Rice Ribbons by Lady and Pups. The ingredient list might look very long, but it creates the best noodle sauce ever, and you’ll fall in love with it immediately. 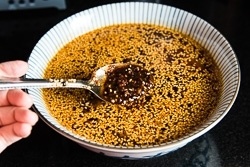 A note about serving the noodles: the chili oil recipe uses tons of chili powder. DO add plenty of chili powder when serving the noodles. Yes, the dish will be very spicy. But the chili powder brings out a very nutty flavor and creates a thick texture that is essential to the dish. This recipe will generate more chili oil and soy sauce you’ll need for one meal (which serves 4 people). However, do make sure you follow the quantities of this recipe to create extra sauce. It’ll become a great solution for cooking quick and delicious lunches. Option 1 – Create a new version of Biang Biang noodles with different toppings. Such as tomato egg stir-fry (classic Chinese), blanched or grilled chicken, grilled beef, or stir-fried ground chicken. You can top any of these on freshly boiled noodles and drizzle with chili oil and seasoned soy sauce. 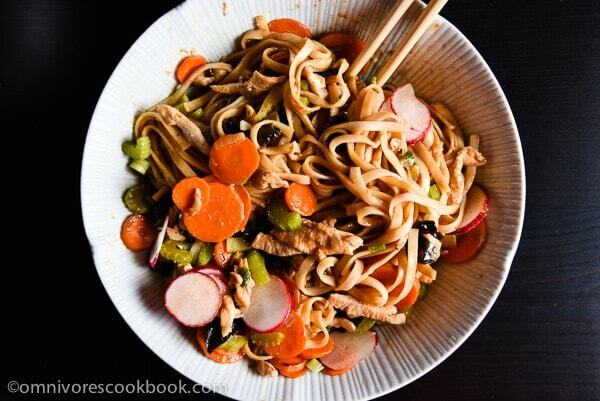 Option 2 – Add a quick nutty sauce to make sesame noodles. Combine peanut butter (or Chinese sesame paste), soy sauce, and black vinegar in a small bowl. The ratio should be 1:1:1. Mix well. For example, I did this with the only leftovers in my fridge yesterday. I used some carrot, celery and wood ear mushrooms to make a quick stir-fry. I chopped a chicken breast and stir fried it with green onion. I seasoned it with soy sauce and salt without marinating. Then I used the formula above to combine everything together. And bam! Two big bowls of super tasty noodles were ready. Easy! You can even simplify the process by using sliced cucumber (for a vegan dish), leftover meat, or any blanched veggies that come to mind. Option 3 – Use the seasoned soy sauce and chili oil to create an awesome salad/side. You can make cool things, such as red-oil chicken, with blanched chicken breast and these two sauces. Or you can drizzle them on blanched broccoli, smashed cucumber, or other veggies to create a quick side dish. Do you like my recipes? 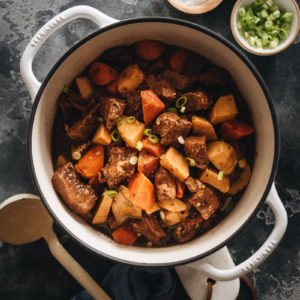 Sign up for Omnivore’s Cookbook’s weekly newsletterto get the latest updates delivered to your inbox and a free e-cookbook! And stay connected via Facebook, Instagram, Pinterest and Google+. Thanks so much for reading, and happy cooking! 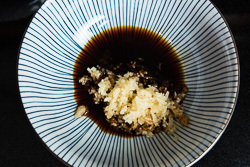 Combine soy sauce and garlic in a small bowl. Add peanut oil, chili powder, white sesame seeds, star anise, dried bay leaves, coriander powder, and cumin powder into a large skillet (or a wok). Heat over medium low heat until it reaches a gentle sizzle. Turn to low heat. Stir constantly. 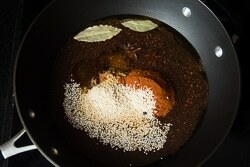 Keep cooking until the chili powder turns dark brown (without turning black), 3 to 4 minutes. If the oil starts to bubble fiercely, remove it from heat. 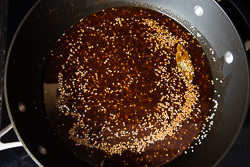 Remove the skillet from heat immediately and add ground Sichuan peppercorn. Gently stir a few times and let cook for 10 to 20 seconds. Carefully add garlic and soy sauce with a ladle. 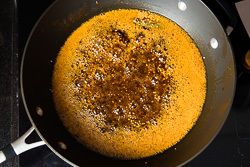 The oil will sizzle for a while due to the added liquid. When the sizzle dies down a bit, stir gently with a spatula to mix everything well (see footnote 2). Transfer everything to a heat resistant bowl to let oil cool off faster. When the chili oil has cooled, discard bay leaves and star anise. Let sit for 2 hours, or up to overnight, before using. 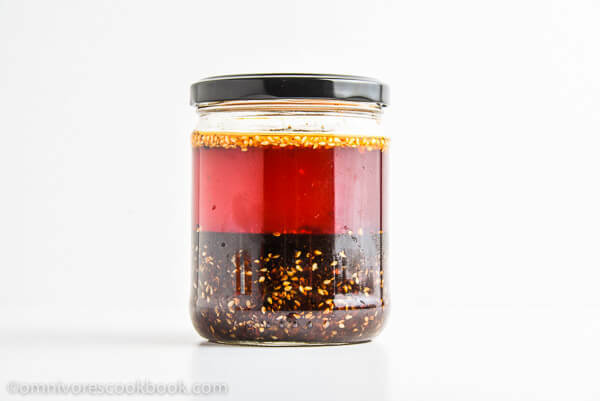 Transfer the leftover chili oil to a air-tight glass jar or glass container and store in the fridge up to 1 month. 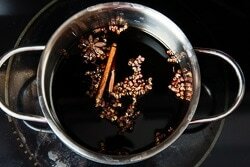 Add soy sauce, water, sugar, whole Sichuan peppercorn, star anise, cinnamon stick, and cloves into a small saucepan. Heat over medium low heat until it reaches a simmer. Turn to low heat and let simmer for 15 minutes. Strain the sauce and discard the spices. Add black vinegar and mix well. Allow to cool before using. 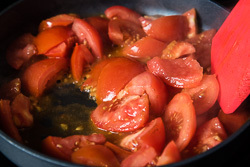 Add oil to a medium-sized skillet and heat over medium heat until warm. Add tomato and tomato paste. Chop and stir the tomatoes. 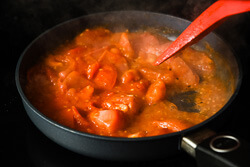 Cook until the tomato pieces break down and form a thick sauce, 5 to 7 minutes. Transfer to a bowl. Boil noodles according to instructions. Drain and run tap water over noodles. Drain again and transfer to servings bowls. Add tomato paste and seasoned soy sauce according to taste. Add plenty of chili oil with the chili powder (*see footnote 3). Top noodles with cucumber, radish, green onion, and cilantro. You can serve this dish without the tomato sauce, but I highly recommend you to add it. The tomato sauce helps balancing the spiciness and adds a nice thick mouthfeel to the noodle sauce. 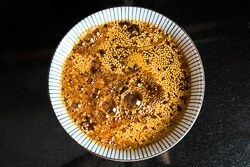 When I was taking the step-by-step pictures, I poured the oil into the garlic and soy sauce bowl. Please follow steps in the recipe instead. It’s much easier and safer this way. I usually start by adding 2 tablespoons of each. And more soy sauce to increase saltiness or more chili oil to increase spiciness. The noodles should able to be evenly coated with sauce. Add more tomato sauce if it becomes too spicy. These noodles look so delicious! 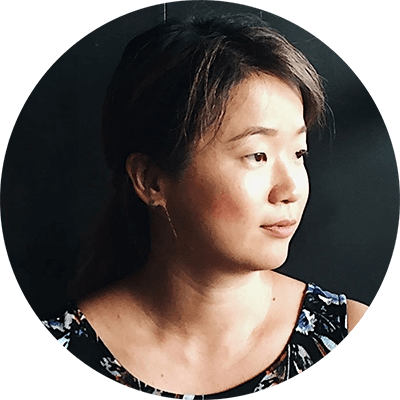 I always love your detailed descriptions and history of the dishes, it’s so interesting! 58 strokes in 1 character? That’s fascinating, Maggie! As for the noodles, well, I’ve been eyeing them up already on social media … they look just incredible. So simple (as usual) and tasty (as usual). You are my real Chinese food guru, Maggie! These noodles look so amazing, Maggie! I am a huge fan of big fat noodles so this is pretty much my dream meal. Love your photos! That character! Love these chunky noodles Maggie! Great flavors! The care in which you take and the extent of helpful information you provide constantly blows my mind. This looks incredible Maggie. I LOVE spicy and big flavours and this just ticks all my boxes! Pinning! 3 amazing sauces and one very delicious dish! It really is all about the sauces and the texture of the noodles that makes this dish so delicious. Great instructions and beautiful photos! 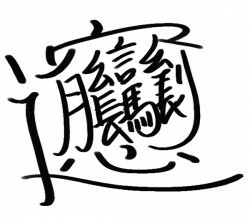 Now you know why it is so difficult for me to learn Chinese Characters, 58 strokes, oh my goodness. I hope that one is not on the boys vocabulary list or I am throwing in the towel! Pinning and sharing my friend! I think some of the very best foods come from simple means. 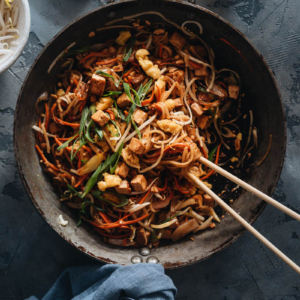 I have somewhat of an addiction to spicy noodle dishes and this looks like it would totally satisfy my cravings – definitely a foodgasm! Hi Maggie, I would like to make this dish this weekend, could you please clarify something – in the cooking notes you mention curry powder but this is not mentioned in the ingredient list. Were you referring to the cumin/coriander powder? I made your hand stretched noodles last night, they were fantastic. Thanks for your recipes! Hi Mary, thank you for letting me know this! I just updated the recipe and deleted curry powder from the instructions. A pinch of curry powder can be added into the chili oil, as a hidden flavor. But since it won’t make a huge difference, I decided it’s totally OK to skip it. Hi Maggie, thanks for sharing your recipe. At first, the recipe looked daunting, but I made the chili oil one day, a few days later made the seasoned soy sauce, then the noodles, meat, vegetables (cabbage and bean sprouts) a few days later. The noodles were delicious, just like the noodles I had at a restaurant in Seattle. The noodles take a little planning but are well worth the effort. Everyone who has tried the noodles have loved them! Hi Karen, I’m so thrilled to hear you made this dish! When I posted the recipe, I thought “who’s gonna make it?”. It looks so long! Just like you mentioned, we usually cook the sauces separately in large batches, so it won’t be too time consuming when you put the noodle dish together. Now since you have the seasoned soy sauce and chili oil, you can make many dishes or use them to make stir fry. One sauce I love: add the seasoned soy sauce and chili oil into peanut butter, then you get the best peanut sauce. It’s so good serving with chicken. Hi can I use any red chilli powder? Hi Ting, yes you can. Just note that depends on the spiciness of the chili powder, the hot oil might come out quite spicy. In that case, use less in your noodles otherwise the dish might end up too hot. Maggie! What a gift you have given us with this amazing recipe!! I live in Canada and these noodles remind me of Xi’an Famous – my favorite NYC noodle joint. When I cook this sauce, I always add 1 package of Filipino Magic Sarap in my wok while sautéing my protein/veggies. Amazing kick to your delicious recipe. ? I’ve never tried Filipino Magic Sarap but it sounds so yummy! I have yet been to Xi’an Famous. Will definitely add it onto my to-eat list when I travel to New York the next time. This is my first time attempting any sort of Chinese food from scratch. I used your sauce recipe (w/o the optional tomato) as I was originally just looking for a spicy Szechuan heavy sauce, similar to some I’ve had in the past, to use with some similar hand made egg noodles I was making. Delicious! The sauce was so good, I feel like a (semi) pro now! I will definitely try your noodle recipe soon as I’d like to try this dish again without egg taste. I believe this character has a bit less strokes. Only 55. I counted number of stokes many times and never come to 58. Hello, this looks delicious! For the soy sauce, is it 3/4 cup? The unit seems to be missing from the recipe. Thanks! Sorry about that! Yes, it is 3/4 cup. I just updated the recipe so it should look good now. Happy cooking!